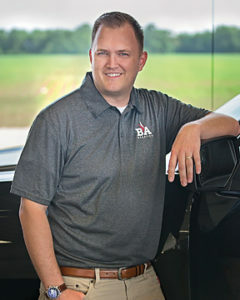 Meet B&A’s Business Operations Manager, known as the BOM, Daniel Hardy! Daniel is originally from Greenfield, Indiana and earned a Bachelor of Business Administration from Indiana University and is currently pursing a masters in business from Indiana University as well. Daniel began his career in agriculture production at a seed company following undergrad. He worked his way up ultimately serving as their Business Operation Manager before beginning his career at B&A. As the BOM, Daniel focuses on the day-to-day business operations of B&A Genetics to keep things running smoothly. Outside of the office, Daniel enjoys spending time with his wife and three kids!